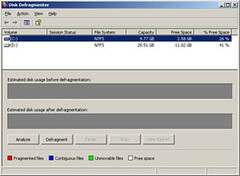 Perform Disk Defragmentation once a month will speed up your window performance. How can I perform Disk Defragmentation? Note: you can use Analyze to try if your drive need to be defragment. Everytime i performed the disk defragmentation, i can feel my window run more smoothly than before especially when i start program.